• PPV can be used to diagnose and treat posterior segment uveitis and conditions that mimic uveitis. • PPV can also be used to treat complications of uveitis, such as rhegmatogenous or tractional retinal detachment, epiretinal membrane, macular hole, cystoid macular edema, and vitreous opacity. • PPV has been thought to itself play a role in controlling ocular inflammation, but due to a lack of evidence it is best used as a last resort for this purpose. As PPV has become more efficient, effective, and safe, due largely to advances in fluidics and operative viewing, with smaller instrumentation, valved trocars, and widefield viewing, it has been successfully used to diagnose posterior segment uveitis and conditions masquerading as uveitis. Figure 1. An 80-year-old Hispanic man with known central nervous system lymphoma and vision loss in his left eye over the past 2 years had vitritis and multiple subretinal lesions, which were observed with fundus photo (A). The lesions often coalesced and were atrophic in spots. Subretinal infiltrates could be seen on OCT (B). Vitreous biopsy diagnosed vitreoretinal lymphoma. Figure 2. 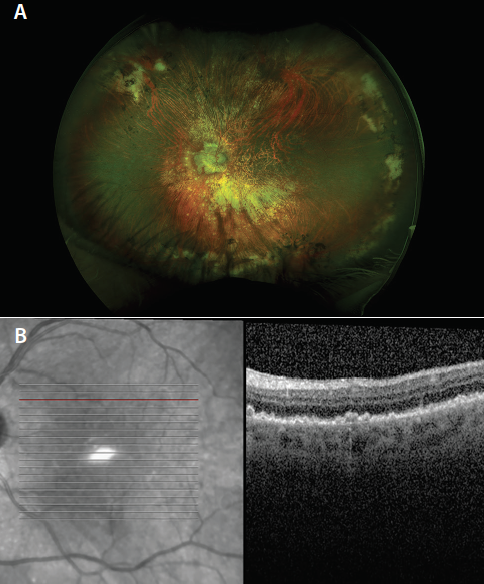 Multiple white epiretinal nodules and vascular leakage (A) are seen in the eye of a 68-year-old woman with vitritis 1 month after uncomplicated macular hole repair. 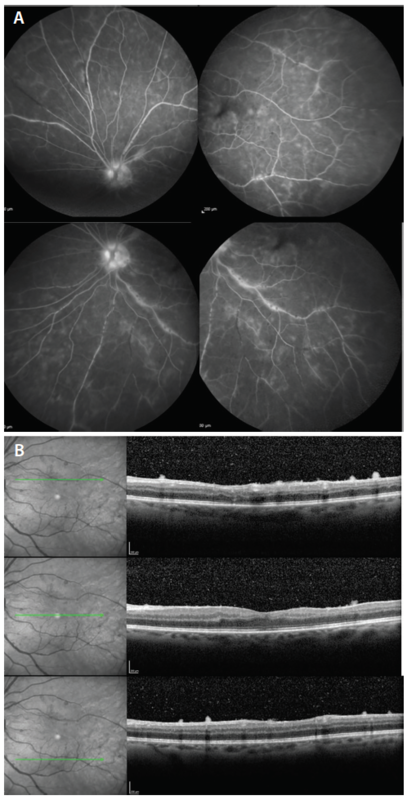 OCT shows multiple small nodules on the retinal surface (B). Aspiration of these small infiltrates was cultured and grew Mycobacterium fortuitum. Diagnostic testing for infectious uveitis is essential. PPV is often used to obtain specimens for culturing in patients with postsurgical endophthalmitis with hand motions or worse VA, chronic postoperative endophthalmitis, or suspected endogenous endophthalmitis. Careful handling of specimens for culture in the microbiology laboratory is important. Polymerase chain reaction can be helpful for rapid identification of bacterial, fungal, and mycobacterial pathogens. Polymerase chain reaction is essential in identifying viral pathogens, toxoplasmosis, and tuberculosis. Intraoperative antibiotics can be given if appropriate pathogens are suspected. If a concurrent retinal detachment is present, silicone oil may be used to maintain postoperative visibility of the fundus, and this may add some antimicrobial properties. Surgeons can safely employ 27-gauge surgery in many of these cases,9 and it does not appear that cut rates or dilution of sample with fluid infusion have an impact on diagnostic yield. PPV has been used to treat many complications of uveitis, such as rhegmatogenous or tractional retinal detachment, epiretinal membrane, macular hole, cystoid macular edema, and vitreous opacity (Figure 3). In all of these settings, perioperative control of inflammation is paramount; however, no comparative data are available to guide choices for perioperative control. Antibiotics are safe for most patients with uveitis from infectious causes, such as in toxoplasmosis or acute retinal necrosis. Perioperative steroids can be given orally, injected in the sub-Tenon space, or topically applied, and choice of agent and dose can be tailored to the risk of recurrent uveitis. For example, for an otherwise healthy patient with difficult-to-control intermediate uveitis undergoing 2 years of methotrexate therapy and epiretinal membrane peel, I would likely recommend adding 30 mg of prednisone daily to the methotrexate starting 1 week before surgery and continuing for 2 weeks after surgery with a rapid taper, in addition to the use of a topical steroid. On the other hand, for a diabetic patient with anterior uveitis that has been quiet for 3 years without the use of medications, I would recommend using topical difluprednate (Durezol, Novartis) four times daily for a few weeks after surgery followed by taper. 1. Schlegel U. Primary CNS lymphoma. Ther Adv Neurol Disord. 2009;2(2):93-104. 2. Facts about uveitis. National Eye Institute (NEI) website. nei.nih.gov/health/uveitis/uveitis. Accessed August 6, 2018. Figure 3. 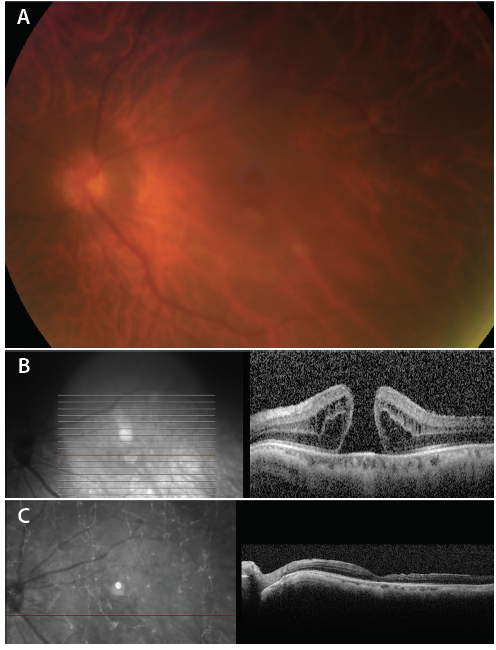 In this 55-year-old man with tuberculous panuveitis (A) and macular hole (B), inflammatory control was achieved with four-drug therapy for tuberculosis and with oral steroids. The macular hole was closed with routine 25-gauge PPV and internal limiting membrane peel (C). The patient’s BCVA improved from 20/100 to 20/30. The eye has been quiet for years. Because it removes immunocompetent cells and cytokines from the vitreous cavity, PPV has long been thought to potentially play a role itself in treating ocular inflammation. Although some data are supportive of this therapeutic role,13 the preponderance of the data are inconclusive.14 Therefore, due to lack of a definitively demonstrated benefit, the use of PPV itself as a means of controlling intraocular inflammation should remain a last resort. 1. Michels RG, Knox DL, Erozan YS, Green WR. Intraocular reticulum cell sarcoma. Diagnosis by pars plana vitrectomy. Arch Ophthalmol. 1975;93(12):1331-1335. 2. Algvere P, Alanko H, Dickhoff K, et al. Pars plana vitrectomy in the management of intraocular inflammation. Acta Ophthalmol (Copenh). 1981;59(5):727-736. 3. Chan CC, Rubenstein JL, Coupland SE, et al. Primary vitreoretinal lymphoma: a report from an International Primary Central Nervous System Lymphoma Collaborative Group symposium. Oncologist. 2011;16(11):1589-1599. 4. Yeh S, Weichel ED, Faia LJ, et al. 25-Gauge transconjunctival sutureless vitrectomy for the diagnosis of intraocular lymphoma. Br J Ophthalmol. 2010;94(5):633-638. 5. Yeh S, Albini TA, Weichel, ED. Current techniques in diagnostic vitrectomy for uveitis. Techniques in Ophthalmology. 2008;6(4):119-127. 6. Jiang T, Zhao Z, Chang Q. Evaluation of cytologic specimens obtained during experimental vitreous biopsy using B-cell lymphoma line. Eur J Ophthalmol. 2014;24(6):911-917. 7. Bonzheim I, Giese S, Deuter C, et al. High frequency of MYD88 mutations in vitreoretinal B-cell lymphoma: a valuable tool to improve diagnostic yield of vitreous aspirates. Blood. 2015;126(1):76-79. 8. Mastropasqua R, Thaung C, Pavesio C, et al. The role of chorioretinal biopsy in the diagnosis of intraocular lymphoma. Am J Ophthalmol. 2015;160(6):1127-1132. 9. Khan MA, Kuley A, Riemann CD, et al. Long-term visual outcomes and safety profile of 27-gauge pars plana vitrectomy for posterior segment disease. Ophthalmology. 2018;125(3):423-431. 10. Branson SV, McClafferty BR, Kurup SK. 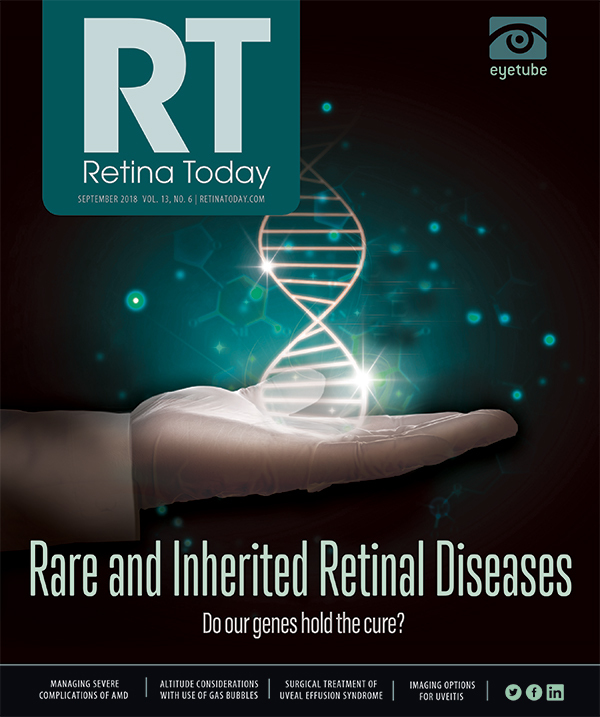 Vitrectomy for epiretinal membranes and macular holes in uveitis patients. J Ocul Pharmacol Ther. 2017;33(4):298-303. 11. Callaway NF, Gonzalez MA, Yonekawa Y, et al. Outcomes of pars plana vitrectomy for macular hole in patients with uveitis [published online ahead of print November 7, 2017]. Retina. 12. Faia LJ, Rao P, Todorich B, et al. Surgical outcomes of epiretinal membrances in patients with a history of well-controlled preoperative uveitis. Paper presented at: Club Jules Gonin Meeting; July 11-14, 2018; Jersey, Channel Islands, Great Britain. 13. Quinones K, Choi JY, Yilmaz T, Kafkala C, Letko E, Foster CS. Pars plana vitrectomy versus immunomodulatory therapy for intermediate uveitis: a prospective, randomized pilot study. Ocul Immunol Inflamm. 2010;18(5):411-417. 14. Henry CR, Becker MD, Yang Y, Davis JL. Pars plana vitrectomy for the treatment of uveitis. Am J Ophthalmol. 2018;190:142-149.